The Mam Ultivent Teat has a texture that replicates the silky smooth texture of your breast. Its unique composition ensures that the teat will not compress, thereby reducing any incident of painful cramps for your baby, and may in fact prevent them altogether. 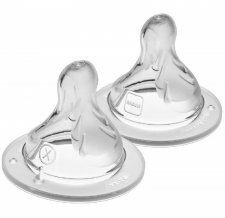 These teats are therefore a fantastic alternative if you are unable to breast feed or are alternating between both breast feeding and bottle. Extra Fast Flow, suitable from 6 months.